Removable: Move between bags in a snap! Looking for convenience and style in one? Our med ID wristlets are the ideal solution for keeping your keys accessible while freeing up your hands! These versatile accessories feature a durable leather wrist strap topped by a keyring, a stylish clasp, and a custom-engravable medical ID charm. Keep your keys on your wrist or clip them onto your purse; either way, our med ID wristlets keep your keys handy and your hands free! *One wristlet included. Additional wristlets displayed to show product dimensions. 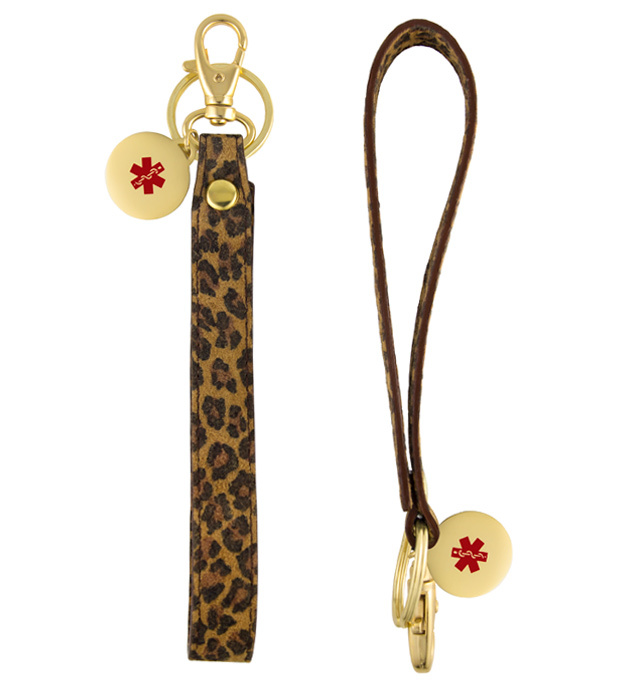 The Marisol Med ID Wristlet is made of sturdy leopard-print leather and a stainless steel grommet, keyring, medical ID charm, and clasp with a gold tone finish. With a large, lobster-style clasp (skip those bulky carabiners! ), this med ID keychain is designed to open and close with just a gentle squeeze while staying put once affixed. The engravable med ID charm features a bold, red caduceus symbol on the front, which alerts first responders to your personal medical information, engraved on the back. Whether you or your loved ones wear a medical alert bracelet for Type 1 Diabetes, allergies (food, drug, environmental), steroid dependency, blood disorders, or any other medical condition or treatment consideration, Med ID Wristlets are an excellent addition to any med ID jewelry collection. Stylish and on-trend, these versatile accessories provide yet another way to communicate your medical information in an emergency.